While we wait for the first egg at the Hays bald eagle nest, other raptors are getting into a breeding mood. Red-tailed hawks are soaring together. 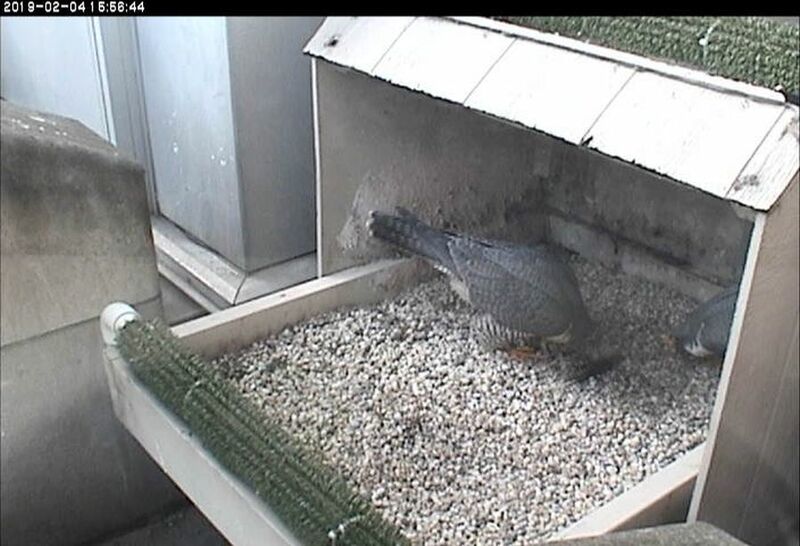 Peregrines are pairing up. Pittsburgh’s peregrines won’t lay eggs until March but they’re already busy claiming territory, attracting mates, and courting. You’ll see them perching near each other in prominent locations, engaging in spectacular courtship flights, the male bringing food for his lady, and the pair bowing at the nest (only visible on a falconcam). This activity makes February and March my favorite months for peregrine watching. Claiming territory is a blatant activity but the peregrine’s first egg date is nearly impossible to determine without a falconcam. Unlike bald eagles, peregrines nest on inaccessible ledges and don’t begin incubation until the next to last egg has been laid. The only sign that they’re incubating is that you see only one peregrine for more than a month; the other one’s on the nest. Thanks to the falconcam at the University of Pittsburgh’s Cathedral of Learning we know that the resident female, Hope, lays her first egg between March 6 and 15. She and her mate Terzo are already courting as seen on Monday Feb 4. Watch them on the National Aviary’s streaming falconcam. 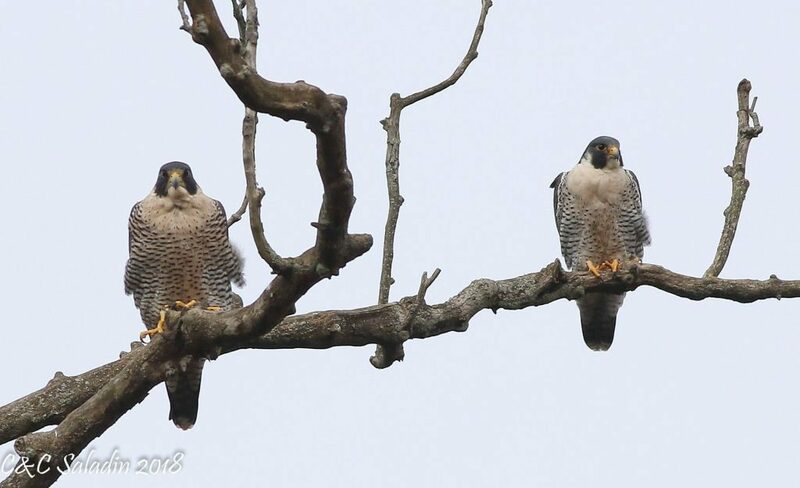 Visit the sites below to see Pittsburgh’s peregrines in person. Every site (except Pitt) needs additional observers and every observation is useful. You can help! Leave a comment if you want to join. For additional information and resources see my Peregrine FAQs page. Mary T, I don’t know if the Cathedral of Learning falconcam has a rewind feature. (It just went live on Feb 1 and I haven’t played with its features yet). I do know that the eaglecam is hosted on YouTube Live while the falconcam is hosted by Ozolio so the features are different. Hi Kate. My husband and I live in Tarentum, kinda under the bridge, and see peregrines frequently. We’d be willing to be observers, since we’re already observing! We see them often, flying through, perching on the bridge and it’s light poles, and sometimes in the trees too. Exciting place to live!